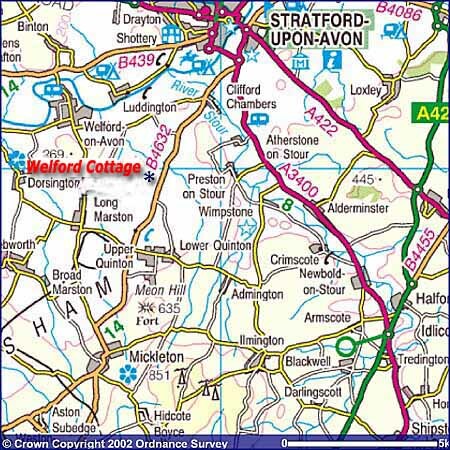 Welford Cottage is a beautiful self-catering holiday property in the heart of the Shakespeare Countryside. 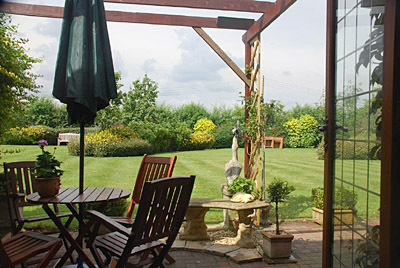 Ideally located on the Cotswolds borders and just a 7 minute drive to Stratford-Upon-Avon. This pretty cottage has been tastefully decorated throughout with antiques and period pieces and can comfortably accommodate 4 people having two double bedrooms, lounge/dining room, luxury bathroom, well-equipped kitchen, sun terrace, landscaped gardens and a wealth of character. The ground floor is open plan with the lounge/dining room having exposed beams and a brick feature fireplace. To ensure your stay is as relaxed as possible you will find candles, music CDs, a large selection of DVDs and also quality magazines at your disposal. The dining area has a glass-topped dining table, which seats four. 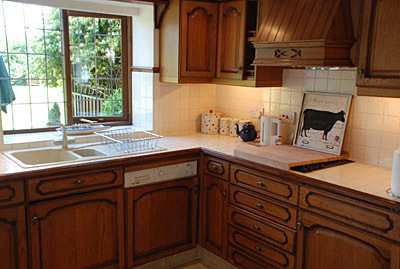 The well equipped kitchen has an electric oven/hob, microwave, fridge, washer/dryer and dishwasher, plus pretty much all the kitchen paraphernalia you should need during your stay. From the lounge, French windows open out onto the private terrace garden, with seating for 4 people and direct access to the landscaped communal gardens. Off the entrance hall there is a downstairs toilet and the staircase leading to the first floor, which has a stylish new bathroom and two elegantly furnished bedrooms - one with a king-size bed and the other with a standard double bed. Both have built-in wardrobes and most importantly comfy mattresses. A Welcome Pack is provided for all stays, which includes teabags, coffee, sugar, Milk, Juice and Cakes/Biscuits. Quality bed linen, towels, tea towels, electricity, hot water, heating, cleaning materials and loo rolls are also included in the rental price. For the comfort of all of our guests, we cannot accommodate pets and smoking is not permitted in the cottage, sorry. The cottage may be deemed unsuitable for people with restricted mobility. 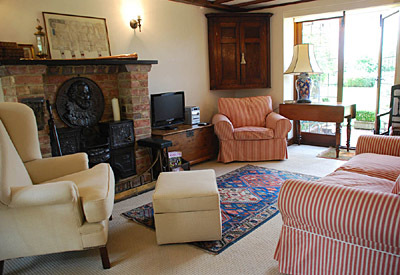 Welford Cottage is perfectly situated to offer the holiday maker and theatre-goer the best of both worlds - the unique character of world famous Historic Stratford-upon-Avon, Shakespeare's Birthplace and the Royal Shakespeare Theatre, the River Avon and Antique & Speciality Shopping Alleys all within a 3 miles drive, combined with a rural retreat and ideally located touring base in beautiful Shakespeare Country at the entrance to the Cotswolds, and 15 minutes from Warwick Castle and Hidcote Manor (National Trust), Chipping Campden and Broadway. 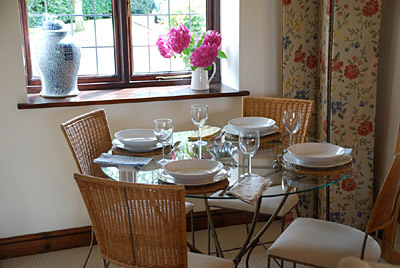 A choice of village country pubs and traditional English Tea Rooms or menus from around the world in the wonderful choice of Restaurants and Inns in the heart of Stratford-upon-Avon. Shakespeare's Stratford on the Web / QuinSolve &COPY; / September 2012. Note: This information was correct at the time of preparation, however QuinSolve accepts no responsibility for discrepancies or omissions.